My goal here was to make a FoW city board quickly and cheaply with three modular 2x4 sections that could line up in a variety of ways. I had some experience making cheap cobblestone so I decided to revisit those methods I used a few years ago. I bought cheap polystyrene 'cracked ice' light panels and painted them up to look like cobblestone. 1st Step: Design three 2x4 sections with interesting intersections and angles. I researched maps of European cities for inspiration and drew up drafts on paper. Once happy I marked them out on the polystyrene light panels with pen and cut them with a rotary tool. 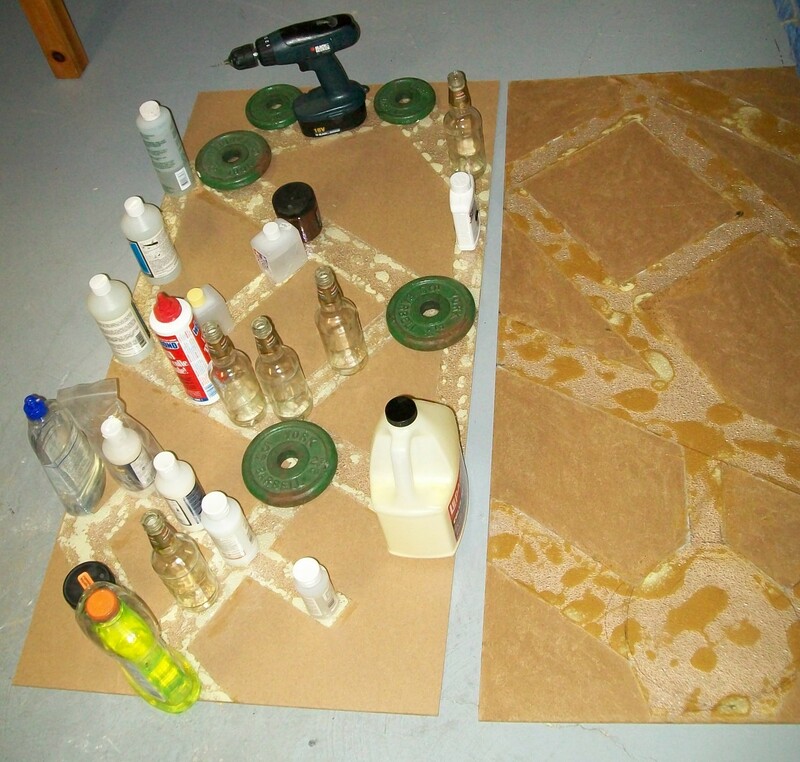 2nd Step: Glue down the cut roads with white glue or carpenter's glue. Place objects on the polystyrene so its as flat as possible after the glue dries (above left side). Primed and starting to paint. 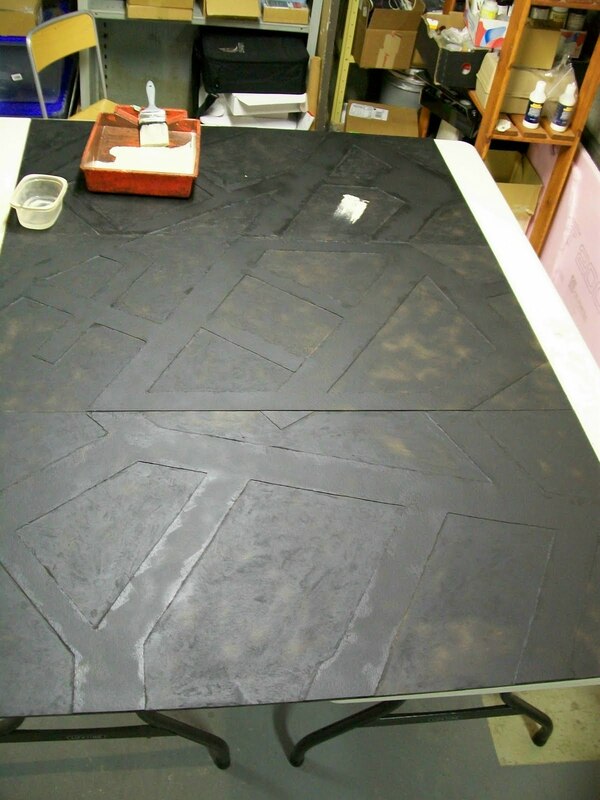 4th Step: Prime it black then paint it. I painted the road a mix of chocolate brown and grey with a unbleached titanium dry brush to give it a darker look as I normally do cobblestone medium grey. 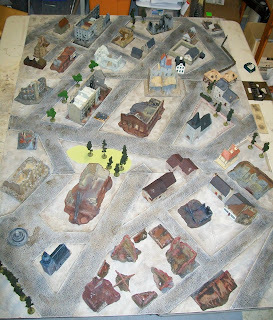 I then painted the non-road areas a pseudo concrete/sand colour to represent empty lots. With Cassino coming out this year and my Fallshirmjagers ready for some Late War action I figured a more Italian feel might be in order so the concrete/sand colour seemed like a good fit. These of course would be 'mostly' covered once buildings are placed. I did throw some washes on both the roads and the empty lot areas. Once dry I varnished the whole board with Krylon Matt Varnish and then a final layer of Testors Dull Cote. Basecoated, washed and drybrushed. Covered with buildings! Final Step: Fill the board with buildings! I am still in the process of painting many of my buildings. But I threw all of the basecoated and completed buildings, that would not look out of place in a city, on the board and had my first game on it! AAR to follow in a day or two. Total cost: Polystyrene ~$20; mdf board -> can't remember but similar to cost of polystyrene; glue -> minimal; half a jar of Liquitex Natural Sand ~$8; paint ~$1 (bought 'oops' cans at Home Depot for dirt cheap and barely used any); 2 Cans of 4$ primer; One can of Dull Cote, one can of Krylon Matt Varnish. Was awesome to see a game played on it last night - I will get the full coverage up on the blog later today - "Breakthrough in Bretislava!!"